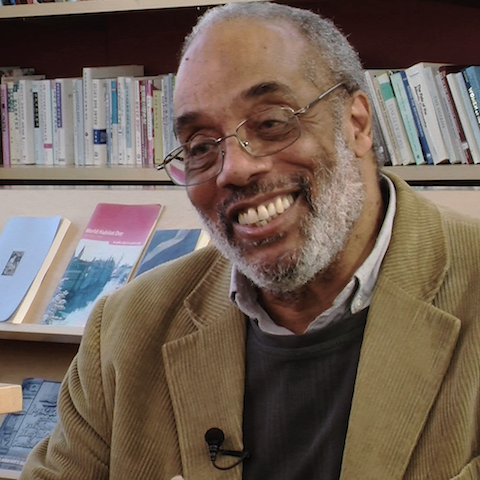 Charles E. Cobb, Jr. is a visiting professor of Africana Studies at Brown University. He is a distinguished journalist and former member of National Geographic Magazine’s editorial staff. He currently is Senior Writer and Diplomatic Correspondent for AllAfrica.com, the leading online provider of news from and about Africa. From 1962-1967 he served as a field secretary for the Student Nonviolent Coordinating Committee (SNCC) in Mississippi. He began his journalism career in 1974 as a reporter for WHUR Radio in Washington, D.C. In 1976 he joined the staff of National Public Radio as a foreign affairs reporter, bringing to that network its first regular coverage of Africa. From 1985 to 1997, Cobb was a National Geographic staff member, traveling the globe to write stories on places from Eritrea to Russia’s Kuril Islands. He is also the co-author, with civil rights organizer and educator Robert P. Moses, of Radical Equations, Civil Rights from Mississippi to the Algebra Project. His latest book published in January 2008 is On the Road to Freedom, a Guided Tour of the Civil Rights Trail. On July 24, 2008 the National Association of Black Journalists honored Cobb’s work by inducting him into their Hall of Fame. Why did SNCC decide to focus on voter registration in Mississippi? How did SNCC workers go about organizing small communities in Mississippi? How did SNCC differ from older black political organizations? Why is it important for high school students to learn about the civil rights movement? How did the MFDP challenge change American politics? Why didn’t the MFDP accept the Democratic Party’s compromise? What was the MFDP challenge at the 1964 Democratic National Convention? How and why was the Mississippi Freedom Democratic Party formed? What role did nonviolence play in the movement? What were the freedom schools? Why did SNCC debate whether to bring white college students down for Freedom Summer? How did the use of violence by Southern whites change in the 1960s? How did black people in Mississippi live with the threat of violence? What kind of hostility did you encounter in Mississippi? What was the civil rights movement? How and why did you first become involved in the civil rights movement?